These treats are made from two of my favorite dessert ingredients, chocolate and meringue. 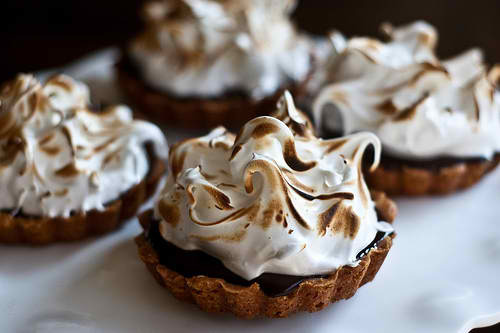 Each tart is consisted of a chocolate crust, creamy chocolate filling and fluffy meringue topping, all made from scratch. They may look intimidating but they are quite easy to make. Here is an easy dessert recipe for Chocolate Meringue Tarts. To make the crust, combine flour, butter, icing sugar and cocoa powder in the bowl of a food processor and pulse until mixture resembles fine breadcrumbs. Add the milk and process until dough just comes together. Place dough onto a lightly floured surface and knead until smooth. Divide pastry dough into 8 equal portions. Roll out each portion into a 4mm-thick disc using a lightly floured rolling pin. Carefully line the rolled pastry into a 3cm-deep, round 8cm tart tin and trim any excess. Repeat with the remaining pastry. Place in the fridge for 30 minutes to rest. Preheat oven to 200°C. Cover each prepared pastry tin with baking paper and fill with pastry weights, rice or dried beans. Place all tins in a baking tray and bake for 15 minutes. Remove the paper and weights and bake for another 10 minutes or until crisp. Reduce oven temperature to 180°C and start preparing the filling. Combine the chopped chocolate and cream in a medium saucepan over low heat. Cook, stirring with a metal spoon, for 5 minutes or until chocolate melts and mixture is smooth. Set aside for 5 minutes to cool slightly. Add the egg and stir until well combined. Spoon chocolate mixture among pastry cases. Bake in oven for 15-20 minutes or until just set. To make the meringue, beat the egg whites using an electric beater until firm peaks form. Gradually add the sugar and whisk until sugar dissolves and mixture is thick and glossy. Spoon or pipe meringue mixture among chocolate tarts. Bake in oven for 5-6 minutes or until light brown. Set aside for 30 minutes to cool before serving.